When thousands of young people checked out of Western society and sought enlightenment in the East, Floyd and Sally McClung set aside the comforts of American suburbia and answered God's call to reach out to them with the gospel. 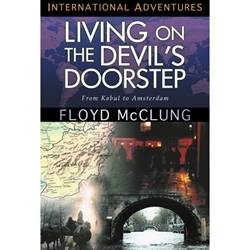 In Kabul, Afghanistan, a key stop on the hippy trail, and later in Amsterdam, Holland, the West's own window to that trail, the McClungs committed themselves to meeting the penniless, the drugged, the sick, and the disillusioned right where they were. Whether among hippy seekers or the addicts and prostitutes of Amsterdam's infamous Red Light District, the McClungs lived out a message of hope. Living on the Devil's Doorstep is a dramatic example of the difference one family can make when they are willing to trust God and walk in obedience to His call for their lives.